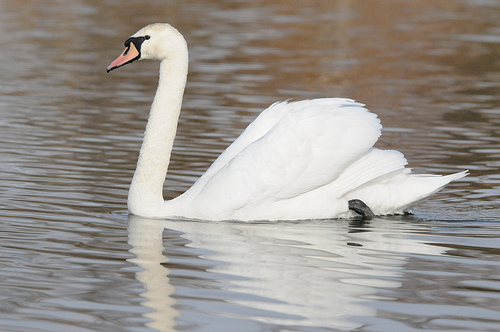 The Mute Swan is a large graceful bird which breeds in quite large numbers in western Europe. Both males and females are white and large and have a distinctive red bill. If you come too close, the nest is defended with much hissing and threats. Flying off is not easy for the large and heavy bird. Only with a decent running start will the bird get out of the water, flying over with a whistling sound of the wings. The Mute Swan has a red or orange beak. The Mute Swan's neck is most often bent. 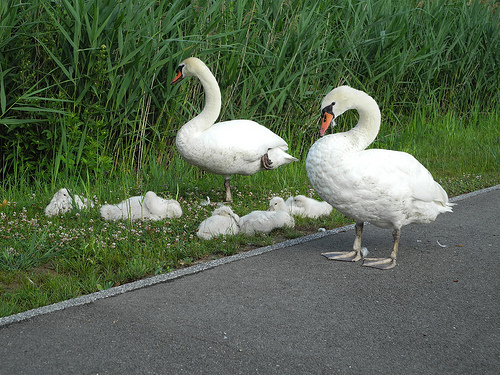 The Mute Swan is considerably larger and has a red or orange beak.